••║► BOLLYWOOD HUNK HRITHIK ROSHAN ◄║•• Official Thread !!! Not all filmmaker-actor relationships are as brittle as the one between Sanjay Leela Bhansali and his protege Ranbir Kapoor. The minute Saawariya flopped Ranbir moved away refusing to do any subsequent film that Bhansali offered him. Ashutosh Gowariker and Hrithik Roshan who collaborated over the historic Jodhaa Akbar have unfortunately come a cropper with their second team-effort Mohenjo Daro. The tabloids are turning turtle tittering over the twosome's torn togetherness. All figments of an over-fertile imagination! For, sources close to both Gowariker and Roshan reveal that the duo is getting together again soon for a third film, regardless of the box office outcome of Mohenjo Daro. Says the source, "Both Ashutosh and Hrithik are far too sorted to indulge in any blame game. Reports of Hrithik sending Ashutosh angry text messages about the failure of Mohenjo Daro are not only false but also misleading. They are meant to create differences between the two by vested interests." The source reveals that Hrithik has the utmost confidence in Ashutosh's abilities. "Hrithik said no to Sanjay Bhansali's Bajirao Mastani, so he could accommodate the huge chunks of dates required for Mahenjo Daro. Does Hrithik regret his choice? Not at all. He is very confident that his third collaboration with Ashutosh would be immensely rewarding." While details of the proposed project bringing the two back are yet to be known one thing that the director and the star-actor are unlikely to do is yet another period film. The word 'clash' wouldn't have been more 'abused'! Even when Rustom and Mohenjo Daro were arriving at the box office on the same day, everyone from the trade, industry and audience cried 'clash'. Ironically though, the only two men who didn't use this word were the main players involved - Akshay Kumar and Hrithik Roshan. They spoke well about each other's promos, wished each other good success in public and private and also refrained from any kind of commenting whatsoever on the 'clash' per se. Yes, one film worked and another didn't. However, neither did one go around the town painting red, nor did the other sulk in the corner. Well, some section of media decided to paint a different picture though. In the recently held private success bash thrown by Akshay Kumar and Twinkle Khanna (where Will Smith was also invited), it was insinuated that Hrithik Roshan was left out of the guest list. Well, as it turned out, this was plain lie that was circulated by those ignorant to the facts. 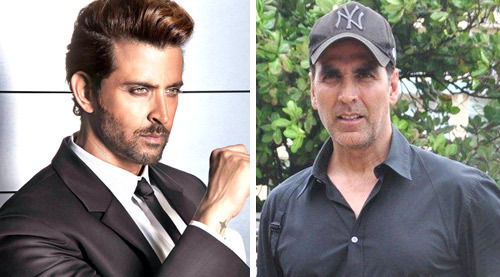 "Hrithik and Akshay are neighbors, and it doesn't even make sense to assume that the two won't meet each others in events of celebrations," says a common friend, "Hrithik was pretty much invited and he even spent over three hours chatting with Akshay. Just because you do not see his pictures circulating around doesn't mean that he wasn't a part of this intimate close knit get together." As a matter of fact, most of the pictures floating around are the selfies that the celebrities took at Akshay's place. There were no media folks invited for the celebrations to report the event and those who gathered outside the gate of Akshay's house could only capture those invitees who were arriving from outside. "While these celebrities were clicked too by the waiting media, Hrithik couldn't have been expected in the frame since he is an insider at the place where Akshay lives. He didn't have to drive in from outside since he just walked in from inside. It is surprising that no one even gave this fact any consideration and a few overzealous media folks just decided to report what they deemed true," the friend continues. However, even in this happy moment, reports that picked up Hrithik as a 'left out guest' were in sheer bad taste, which didn't please either the host or the guest. "This is how attempts are made to put a spanner in relationships. They just scream 'clash', 'rivals' and so on. Thankfully, both Akshay and Hrithik have spent enough time in the business to differentiate between truth and fiction. They are obviously not caring about what is being written or spoken about. They are neighbors and stay on to be cordial. As for them catching up with each other and Will Smith, it was indeed a time to remember and cherish for both." As for the speculations and rumors, guess it is time for them to die a silent death! 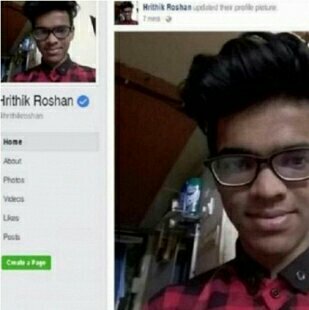 Last evening on 5th September, Hrithik Roshan’s verified Facebook account was hacked by a guy wearing specs. He boldly went on to change the display picture of the Bollywood hero and replaced it with his own picture. As if that weren’t enough he went on to conduct a Facebook Live chat session. Well, guess that means his dream of being Hrithik Roshan was fulfilled, at least for a few minutes. The account was recovered in a matter of minutes. Hrithik then made things lighter by saying “An enterprising individual managed to hack my page earlier in the day. However the matter has been taken care of and the page is mine once more.” Wonder how it's possible to hack accounts!